According to Wauquiez, only 95 Chance-37 boats were built from 1971 through 1977, and "SS Sally Ann" may be one of the finest in existence today. She is a highly capable Blue Water boat ready for serious voyaging or just out island cruising.Seller is moving-up to a larger sailing vessel and is ready for offers now. 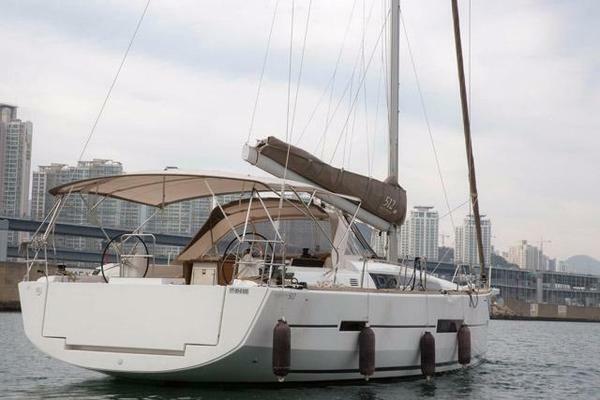 United Yacht Sales New Jersey would love to guide you through a personal showing of this 37' Wauquiez Chance-37 1971. This yacht for sale is located in Fort Pierce, Florida and priced at $30,000. For a showing please contact us by filling out the form on this page and we will get back to you shortly! The cockpit is compact Bluewater style with a steering wheel helm with a modern electronics array pod. The interior arrangement is conventional, but ample beam amidships created a spacious feel below. The two-step entry ladder leads you into the salon with the generous sized navigation center to port and your galley to starboard. Amidships the salon has the dinette to starboard and large sofa to port. The head is just forward and to starboard and continuing forward is the V-berth stateroom.The interior boasts bold black and white striped cushions and abundant European quality teak woodwork found only on high quality boats. All is in above average condition. Wauquiez sailboats are famous for their superb construction with solid fiberglass hull, longitudinal stringers for stiffness and encapsulated bulkheads. The tabbing and fiberglass work are first rate. Henri Wauquiez was one of the first builders to use solid laminate beneath high load deck fittings. Her side decks are wide and chain plates inboard she’s easy to navigate her deck.Bellow the waterline is what really matters at sea. The Chance-37 displaces over 15,000 pounds of which 7,000 pounds is ballast translating to a stiff, sea kindly boat. A fine entry provides enough forefront to prevent pounding during sporty conditions. Her rudder is mounted well aft for excellent steering authority especially on a deep reach. Just returned from an overnighter to the Bahamas with more to come over the season. It's a fun boat--only out of the water for routine maintenance over the past several years. She likes to play for either experienced or new sailors and at over 15,000 pounds, it's a solid Bluewater boat. If desired free sailing lessons after purchase.The boat with its 10 1/2 beam is a delight to sail, faster and more maneuverable than wider boats the same length. Great for single-handing with lines to the cockpit, including the roller-furler jib. Great for two and okay for four.